Multitasking in my very own iPad. When I’m doing car maintenance I usually go about it in a very linear fashion. I disassemble, label and lay out parts, keep notes, etc. I rarely interrupt a job, as I prefer to focus my attention 100% on the task at hand. In other words, I prefer to single-task. Today however, I had a bunch of “routine” tasks to do. The TDI needs new brake pads, as I could hear one of the rears making noise. Sue’s CRD required a fill-up and an oil change. I had a batch of BioDiesel to cook. So today I went out to my little private idaho, my man cave, my â€¦ iPad â€¦ and I multi-tasked. Brake jobs are fairly simple and frankly monotonous. As are oil changes (especially now that I have my “sucka!”). Making BioDiesel is something I do even more often, but it does require more concentration. Unlike the latter two, there are no “wait states” in a brake job, BUT even with a lift it is dirty, uncomfortable work, so I took a break from brakes at the completion of every corner, to wander off and do something else in the task list. 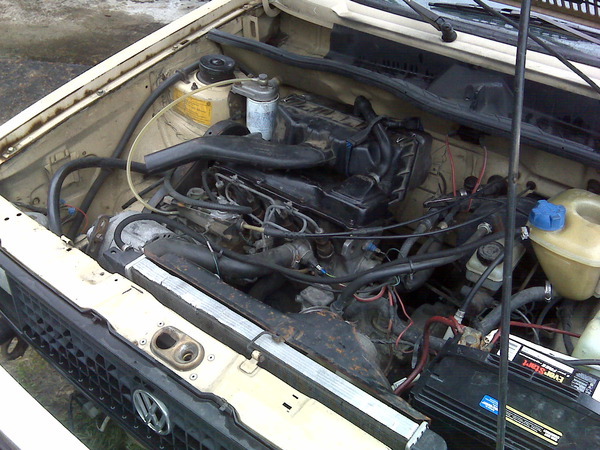 An enforced break also came when my friend and BioDiesel co-op member dropped by with his “new” truck, a 1981 VW Rabbit pickup! Diesel of course. It was cool to see that old 45 HP machine under the hood, as it was also in my first car, a 1980 Diesel Rabbit. Nick came out and helped us unload, and load John up with two 20 gallon barrels of home-brew. The brake pads of the TDI have a sensor built into the left-front side that set off an idiot light on the dash. This light has never come on in my car as of all the pads, this corner had the most left on them. Go figure. The inside pads on both rears were almost gone. The OEM pads back there have a subtle change of pad material in them that makes a grating noise when the pads are worn to that point. This is how I found out it was time to change them rather than the sensor/light combo. I visually check them when I have the wheels off, but will admit to never looking at the inside rear pads, as they are practically invisible, being almost completely obscured by the calipers. I figured if one pad was worn to noise-making I’d change ALL of them. The car has 150,000+ miles on it, so worth the cost of eight brake pads. 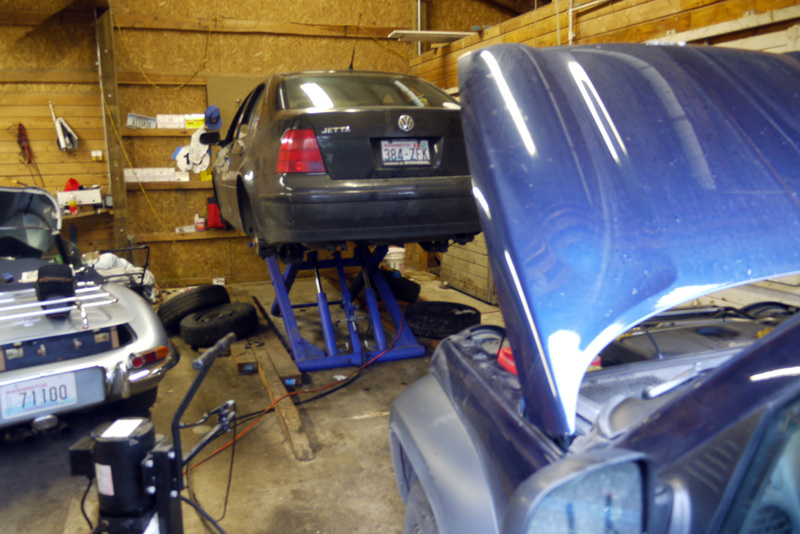 I cooked the home-brew, and changed Sue’s CRD oil with the MityVac between the corners of the TDI. The wheels were back on, and the CRD back in the garage in time to watch the Vancouver Canucks beat the Toronto Maple Leafs on Hockey Night in Canada. After the game I shut off the BioDiesel processor and had a nice dinner. I’ll take the TDI out for a test drive tomorrow. It sure is nice to have my own “iPad” to work in.